A bestseller since its release! This has been an exciting weekend! Even before it was released, Race to Refuge, my latest 16,000-word short story, had climbed onto the Amazon short story bestseller lists. On Friday morning, March fifteenth, when Amazon released the story I checked and was thrilled to see it at number seven on the Science Fiction & Fantasy Short Story List. But, it kept climbing all day. By evening it had reached the number two slot on the bestseller list. Amazon list of March 16, 2019. Click to enlarge. The next morning I checked again and discovered it had reached the number one position on the science fiction list and the number ten spot on the literature and fiction list. I’m writing this blogpost on Sunday and the story is still in the number three position. All I can say is thank you, my readers! In this story, University of Washington students Ryan Palmer and Amy decide to bugout of Seattle when international tensions threaten to boil over into a world war. In normal times their journey to Ryan’s childhood home in rural Idaho would take less than a day. But these aren’t normal times. As they travel supplies become scarce, gasoline becomes impossible to buy, people panic and nuclear war erupts. Together they must confront their worst fears as they fight to reach home and refuge. Click on the following links to read my author bio, or read more about current writing projects. My first book of 2019 is available now! Pundits say that the second-best promotion an author can have is finishing their next book. Well, the graphic design and editing of Race to Refuge flew by and my first release of 2019 is now available for pre-order for only 99 cents. I’ve agreed to give Amazon the exclusive right to sell the book for ninety days. After that, I plan to offer the book on all the major platforms. In Race to Refuge, college student Ryan Palmer wakes up to his girlfriend Amy pounding on the door. She snaps on the television and he learns that the tense world situation is spiraling toward war. As the news grows worse, they decide to bugout of Seattle and go to his parent’s home in Idaho. But panic buying makes finding gasoline impossible and chaos soon follows. The best promotion an author can have is readers that tell other readers. Please, click on the book cover and order Race to Refuge and, when you’re done reading, please leave a review! Race to Refuge will be released in March. I received the cover back from the graphic designer, Domi, of Inspired Cover Designs, yesterday and I’m showing it here first. In this story, University of Washington students Ryan Palmer and Amy decide to bugout of Seattle when world tensions threaten to boil over into world war. In normal times their journey to Ryan’s childhood home in rural Idaho would take less than a day. But these aren’t normal times. As they travel supplies become scarce, gasoline becomes impossible to buy, people panic and nuclear war erupts. Together they must confront their worst fears as they fight to reach home and refuge. Race to Refuge is in final editing. The exact release date hasn’t been set but this standalone novella will be available as a 99 cent ebook on Amazon in March. In the summer the story will be released on other platforms. I was sitting in my living room this morning when I heard a thud. I felt confident that I’d find a heavy box just outside the door, and I did. The delivery service had dropped off a package containing thirty-five copies of Christmas in Time. Both my oldest son and I have stories in the anthology. My contribution is titled, What will you do? It views that very first Christmas through the eyes of one of the shepherds that hear the angels proclaim the birth of Jesus. In his story, The Junkyard Gang, my son, James, shows us a more modern Christmas through the eyes of a young American boy living on a military base in Japan. So, with all these books, we had to get a picture together! The thirty-five copies are for a book signing event at The Station Coffee Bar & Bistro in Centralia this Saturday from 10 a.m. to 2 p.m. My son and I will be there with our other books and there will be eleven other local authors, including five that have stories in Christmas in Time. I’ll get someone to take pictures and I’ll post them in the blog. I should have posted this earlier, but got busy and time slipped away from me, but Christmas in Time deserves to be mentioned. Yesterday Amazon released the ebook version of this Christmas anthology. My story in the collection is titled, What Will You Do? If you pre-ordered book it’s already on your Kindle. The paperback version will be released soon. Below is the text from the back cover of the paperback. Christmas in Time takes a new look at the holiday through the imaginations of these seven Christian authors. Two Golden Rings by Heather Morse Alexander examines tragedy, love, and faith, during the depression. A Country Christmas by Carolyn Bickel blends her knowledge of farm life into a down-home country Christmas. Christmas Stars by Barbara Tifft Blakey provides a well-researched glimpse of the season during the middle ages. A Home for Christmas by Kristie Kandoll gives us a frosty Dakota frontier holiday through the eyes of a pioneer. An English Christmas Treasure by Romance writer Debby Lee delivers a peek into a Victorian-era Christmas. The Junkyard Gang by James K. Pratt shows us a Christmas through the eyes of a young American boy in Japan. What Will You Do? by Kyle Pratt views the nativity through the eyes of a shepherd. From Judea on that very first Christmas to England, Bavaria, Japan, and the United States, Christmas in Time explores love, faith, and hope through the eyes and hearts of ordinary people. Christmas is coming soon. Click on the book cover or here to order a copy. I think you’ll enjoy it. I’m late, but the book isn’t! I’m late writing this blogpost, but I got the book out on time! 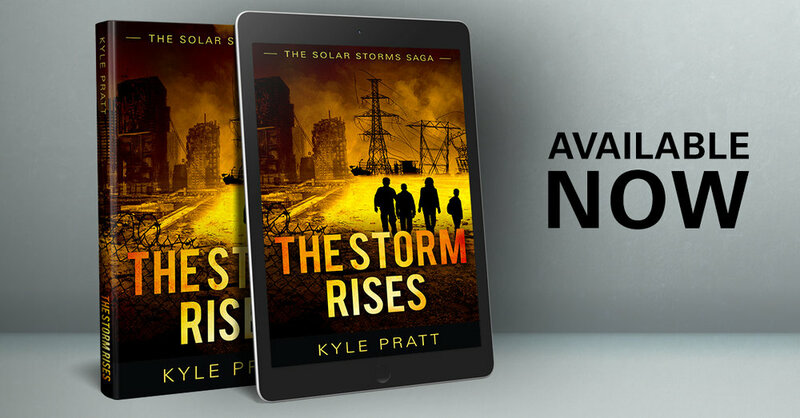 The Storm Rises, book 0 in the Solar Storms Saga was released on September 21st and is available now exclusively on Amazon in both ebook and paperback versions. So far the novella has all five-star reviews and none of the reviewers are related to me by blood or marriage. For those of you unfamiliar with the story, The Storm Rises is a sidequel, or parallel, story to Through the Storm, book one of the Solar Storms Saga. Both happen over the same time period and some characters are in both books. Below is the back cover blurb for The Storm Rises. After a camping trip with his oldest son, Major Dirk Franklin comes home to find a Humvee parked in front of his house. His wife, Carol, tells him the news channels are talking about a storm on the sun. Moments later he’s whisked away to a secret military facility in Portland. There, Major Franklin and others struggle to prepare for the coming collapse of society. As the world sinks into darkness, Franklin fights to save his family and the last threads of civilization. I’m calling The Storm Rises book zero of the series. 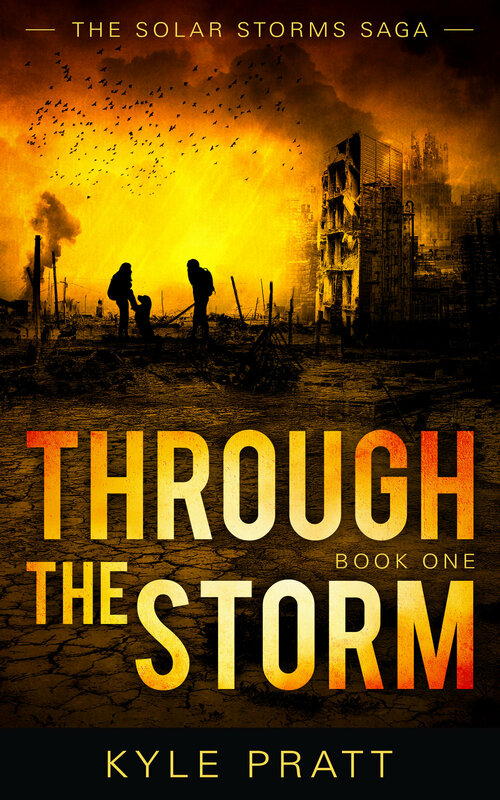 Through the Storm, which is already available on Amazon, is book one. Book two in the series, Facing the Storm, will be released next year. Click on either image for more information or to buy the book. Most of us are familiar with the birth of Jesus from the biblical account. In Luke, we read that on that first Christmas an angel appeared to shepherds and tells them that the Messiah has been born in Bethlehem. They run to the village and see the baby Jesus. While that account is beautiful, in both its telling and meaning, I’ve felt for a long time that it’s merely the surface layer of a much deeper story. Why did the angel tell the shepherds? Did Satan know about the birth? Did he try to stop the shepherds or even kill the baby Jesus? Perhaps I will receive answers to those questions when I stand before God, but probably not while we’re here on Earth. Still, I wonder and, since I'm a writer, I took pen in hand and using the talents God gave me created an answer. My story, What Will You Do, will appear in the Christmas in Time anthology coming out this October. Between then and now you can read more about the both right here. I hope you enjoy my contribution to the anthology along with the other six stories. Click on the following links to read my author bio, or to read more about this and other writing projects, or to read more about my faith. I’m working on a Christmas story. Where I live, in the northern hemisphere, we’re less than two weeks from the official start of summer, but I’m trying to write about Christmas. Lately, it has been really nice outside, warm but not hot. The swallows and hummingbirds have returned and the rabbits and squirrels are very active. Many of the flowers are in full bloom. Out in the orchard, the flowers on the fruit trees have gone, but now you can see the apples, pears, and plums growing on the limbs. Meanwhile, I’m sitting in this office trying to write a Christmas story. My story is part of an anthology with seven other writers. The anthology is titled, Christmas in Time and my story is called, What will you do? Each story is set during a different time period. My story looks at the first Christmas through the eyes of Tovi, a shepherd out in the field on the night of Christ’s birth. Tovi believes in God, but life has beaten him down. So early on that very special day, he prays that God will help him understand why things have happened. I’ll finish the story this by the end of the month, earlier if the weather turns cool. Click on the following links to read my author bio, or to read more about this and other writing projects. I’d like to be on top, but I’ll settle for the slow climb. There is a saying in the writing world that an author is only as good as their latest book. Now with computers and the internet many authors can check their sales and rank in near real time. This can be both a good thing and bad. On September 25th, the release day for Through the Storm, the novel stood at 750 on the Amazon post-apocalyptic bestseller list. I’ll admit that I felt a bit down. Sometimes the first day or two is the peak of sales and then the book starts a slow slide down to obscurity. When I checked the next morning the book had reached the 303 spot on the list. A few hours later it stood at 320. I stopped checking. This morning I needed to view the page for another reason and learned Through the Storm had reached the top 100. At the moment, I’m thrilled and hope the novel continues its slow climb. Today at 4:00 pm (Pacific Time) I’ll be live on The Write Stuff radio program with Parker J. Cole of PJC Media and WLUV Detroit to discuss my latest novel Through the Storm. In this latest novel, Neal Evans is in Nevada when he hears that an immense coronal mass ejection will soon slam into the Earth’s magnetosphere. Will it cause only beautiful auroras to dance across the night sky or will it throw technology back a hundred years? Politicians and scientists are still debating when Neal decides to act. As night falls, he has ten hours to reach home before the first CME strikes. Drake Evans is a happy high school freshman. Conner, his older brother, has gone hunting, instead of watching over him while their father is away at the conference. So now it’s party time! As the world sinks into darkness, Neal and Conner must confront a dangerous new world on their long journeys home. Drake, alone on the farm, must become a man even before he figures out his teen years. The worldwide release of my latest novel, Through the Storm, occurred this morning—while I slept actually. Despite my sleeping through the moment, I am excited about this new book. The ebook released today, because of a few logistical problems the paperback will come out later this week and audiobook next month. An immense storm on the sun has flung four coronal mass ejections at the Earth. That’s the news Neal Evans hears while hundreds of miles from home at a conference in Nevada. Will it cause only beautiful auroras to dance across the night sky or plunge technology back a hundred years? As politicians and scientists debate, Neal drives north toward home. On the family farm, Drake Evans is a happy high school freshman. Instead of staying home with his younger brother, Conner Evans has gone hunting. So, it’s party time for Drake! As the world descends into darkness, Neal and Conner must confront panic, hunger, and fear on their long journeys home. Drake, alone on the farm, must become a man even before he unravels his teen years. For the first ninety days the novel is available exclusively on Amazon. The paperback will be available in a few days, the audiobook will be released in late October or early November. The book will appear on Nook, Kobo and other platforms with the start of 2018. Return to Earth Cover Reveal! Since the March release of Seekers of Earth, events have moved rapidly with the Guardian Knights of Terra series. As I mentioned above interest in the series has allowed for the third book to be written. Since we already had the name for the third book and wanted to continue with a design similar to Seekers of Earth and Recall the Earth we went ahead with the creation of the ebook cover. 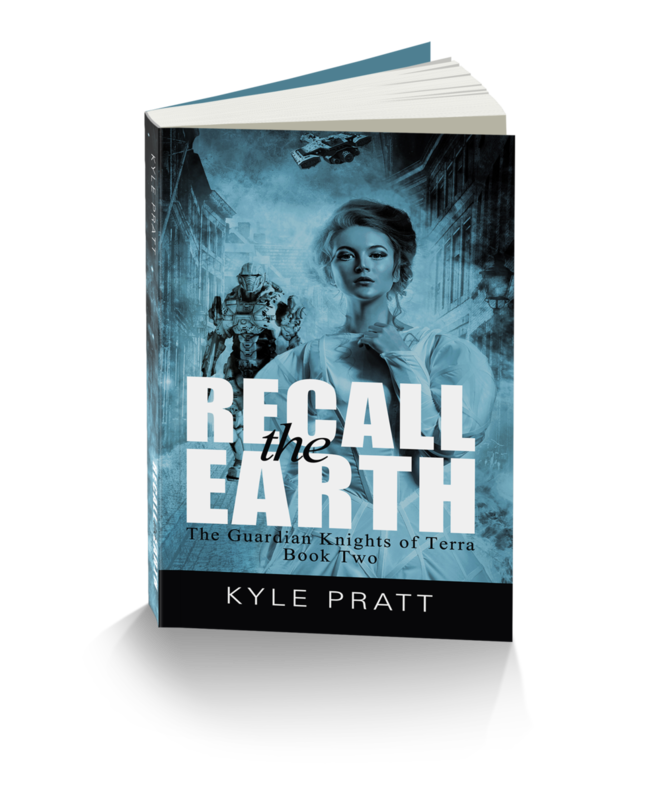 Here, for the first time in public, is the cover of the third book in the Guardian Knights of Terra series, Return to Earth. On the left we see Lucas with a serious look on his face. On the right is Rachel. She appears to be in a better mood, probably because she is returning to her home planet of Earth. The Space Needle, a local landmark, is behind her. I’ve plotted most of the book and completed the first chapter, but we don’t have a Return to Earth web page up (but I’m working on it) and we don’t have a release date, but I’m shooting for late this year. Hopefully, it can be a Christmas gift! Events are moving rapidly with the Guardian Knights of Terra series so, I decided to make three announcements in one blogpost. 1. The ebook edition of Seekers of Earth, the first book in the Guardian Knights of Terra series is on sale for 99 cents. This deal won’t last so, if you were thinking about getting the Seekers of Earth ebook now is the time to act. 2. We released Seekers of Earth in March and Recall the Earth in April. At that time no decision had been made on the third book. I’m pleased to announce that I’ve begun work on the third book in the series, Return to Earth. No release date has been set, but I’m hoping for late this year. Hopefully, it can be a Christmas gift! 3. Since we already had the name Return to Earth, we went ahead with designing the cover. The design work is now complete and we’ll have the cover reveal in the next newsletter which should be out in a few days. If you haven’t signed up for my FREE email newsletter, click here to do so. And a third one is coming! This last month has been very busy with the March 17th release of Seekers of Earth, the first book in the Guardian Knights of Terra series. This was followed on April 7th by the release of book two, Recall the Earth. At this time both books are available exclusively on Amazon.com. I planned the Guardian Knights of Terra series as a five book series. Just like movie sequels and television series, money determines the length of a book series. However, I pleased to report that I’m writing Return to Earth, the third book in the series. No release date has yet been set. Lucas Baldwin, the young son of a powerful lord, is on his first deep space training mission. Advancing through a captured facility he encounters a lunatic girl about his age. Only later does he realize that the girl, Rachel, is speaking English, a long dead language. Rachel talks of an Earth still in existence and more advanced than the horse-and-buggy world that had supposedly been destroyed. Seekers of Earth is a 38,000-word introductory novella to the Guardian Knights of Terra series. Click here to buy Seekers of Earth on Amazon.com. Lucas’s sister, Katherine, smuggles Rachel to their home planet in the Devon system, but when they arrive, Prince Draven and the soldiers of Nightwatch are waiting to kill them. Seriously wounded in battle on another world, Lucas has no idea of the danger facing his sister and Rachel, or that the Valac are fighting to surround his home world. His entire family may die before he can do anything to save them. But stories of Rachel and Earth are spreading, even as Nightwatch strives to arrest or kill all those who learn the truth. Click here to buy Recall the Earth on Amazon.com. When I began writing The Long Way Home I planned on it being a novelette of about 8,000 words. Sometimes a story has a mind of its own. The completed manuscript turned into a 21,000 word novella. As with Nightmare in Slow Motion, readers of the Strengthen What Remains novels have seen part of the story, and many have asked me to fill in the blanks. The Long Way Home takes place as chapters eight through twenty-two unfold in the novel Through Many Fires. This story focuses on Trevor, the father of Caden Westmore. Five cities had already been decimated by nuclear terrorism when Trevor sets out on a mission to bring Sue, his pregnant daughter-in-law, back to the relative safety of the family farm. He also hopes to find his daughter Lisa and bring her home. But, almost immediately upon finding Sue, in the suburbs of Seattle, terrorists detonate another nuclear bomb and the two must flee amid the chaos and fallout. It took me much longer than expected to write, but it was released earlier today and is available on Amazon, Kobo and Smashwords. The novella will be available soon on other sites. Readers, let me know what you think, and please review the book. Thanks! A new book and a new edition are coming soon. The final book in the Strengthen What Remains series, at least for now, is the 20,000 word novella, The Long Way Home. The story will be released on July 15th, but is available for preorder on Amazon and Smashwords, and will soon be available on Nook and Kobo. Five cities had already been decimated by nuclear terrorism when Trevor Westmore sets out on a mission to bring Sue, his pregnant daughter-in-law, back to the relative safety of the family farm. He also hopes to find his daughter Lisa and bring her home. But, almost immediately upon finding Sue, in the suburbs of Seattle, terrorists detonate another nuclear bomb and the two must flee amid the chaos and fallout. The Strengthen What Remains omnibus edition is scheduled for release on August 26. This ebook only edition will include the three novels, Through Many Fires, A Time to Endure, and Braving the Storms. Also included is the novelette, Nightmare in Slow Motion and the yet to be released novella, The Long Way Home, described above. While the final price has not been set, the plan is to save readers money over buying the books individually. A pre-order page will be created later this month. Nearly ten months ago I sold the first copy of Braving the Storms. Kyle Pratt and Bill Radtke on March 20, 2015 with a check for the unnamed third book. That was before the book even had a name. I had gone to deliver copies of Through Many Fires and A Time to Endure to my friend, Bill Radtke. I told him he could have them, but he wanted to buy them. That was back on March 20, 2015. As we talked he asked me about the third book in the series. I told him most of the book had been plotted and I had written about 15,000 words. Kyle Pratt and Bill Radtke ten months later with Braving the Storms. He insisted on paying me for the unnamed book right then. I had the good sense to get a picture of him handing me that check and wrote about it here. Today, almost ten months later, I’ve completed the 77,000 word, 258 page novel, and delivered his copy of the now named book. Bill, I hope you enjoy your copy of Braving the Storms. The year 1985 was a memorable time for me. That year I was stationed in Japan with the U.S. navy and writing short stories that I hoped someday might be printed. That was also the year Back to the Future came out. Along with my family, I saw the movie in a Japanese theater. Kanji scrolled along one side as we watched. While I enjoyed the whole movie a scene at the end stuck in my memory. In the last minutes of the film Bif rushes into the McFly home with a package and announces, “Mr. McFly, Mr. McFly, this just arrived … I think it's your new book.” They open it and lift out a copy of George McFly’s novel, A Match Made in Space. As I walked from the theater I recalled that scene, and thought that opening a box and seeing your book for the first time would be a really cool moment. I never forgot that scene, and I think of it again each time a package arrives containing my copies of a new release. This is the fourth time books have arrived on my doorstep and the moment in Back to the Future flashed through my mind as I opened the box and lifted the first copy of Braving the Storms. This recent delivery contained twenty copies of that latest novel. I’ll be keeping one or two. The rest I’ll be signing and sending off to editors, bloggers, reviewers and beta-readers or handing to critique group partners. So, if I said you’ll be getting a copy of my new book—it’s coming soon! Braving the Storms is off to a good start. With the holidays I’ve been slow to write anything, except Christmas cards, but this deserves mention. The release of Braving the Storms, the third book in the Strengthen What Remains series, was released on December 18th. By the next day the book surged onto the Amazon war fiction best seller list and reached number 77 later in the day. What thrilled me about the early sales was we hadn’t started any paid advertising yet. Braving the Storms made it to the best seller lists based on the support from fans of the earlier books. Thank you! Today Braving the Storms was released worldwide! I was barely out of bed this morning when my wife Lorraine said, “Check your sales—how many books have you sold?” Braving the Storms, the third book in my Strengthen What Remains series, released worldwide this morning as an ebook. If you pre-ordered it on Amazon, Kobo or Smashwords the book should be on your device. By the time you read this it should be available on Barnes & Noble (Nook), and iTunes. The paperback also released this morning, but will take a while to show up on Amazon and Barnes & Noble. So, I told Lorraine about the sales and was hoping for a quiet extended weekend leading up to Christmas. Then I remembered that Kevin Pierce, the narrator for both Through Many Fires and A Time to Endure, still needed the Braving the Storms manuscript. I emailed the script to him and we formalized the production agreement. The audiobook should be available by late January. Maybe I can take tomorrow off.